Our FARM Gathering Program is a professionally designed 8.5 x 11 booklet. The front and back covers are in color; however, advertising is only available in black and white or grey scale. These programs are a great resource, typically kept from year to year. In addition to the full conference schedule, they contain showcase artist photos/bios, award recipient tributes and most importantly, attendee contact information. Your advertisement will be seen by attendees of the conference as well as non-attending sponsors and other interested parties. The potential exposure is several hundred music professionals and the cost is incredibly affordable. Click the cover to download last year’s program. The artwork file name should have your name (or organization name) in it (the same name that is associated with the PayPal account you paid with, the check you sent, or the name you registered for the conference with) and please include your phone number in your email message. Act or artist name MUST be part of the filename! We are now offering ad space on our website. Pricing varies depending on the time of year and length of time. Additionally, we provide all of our attendees with our eco-friendly, very useable tote bag or similar perk. For only $75 we’ll include your swag in all bags. Because we are making an effort to be ecologically conscious we ask that you think ‘green’ with your swag as well. Reusable items such as stickers, pens, key chains, CDs work great! Postcards and flyers are fine, but keep in mind that these items can be put on our display tables for no charge. 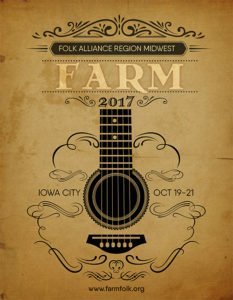 AND send an email to conference@farmfolk.org that you have shipped your items so we can track your package. Please provide quantities of at least 350.